Ebbsfleet dented Wrexham's title hopes and boosted their own play-off ambitions with victory despite the players refusing to warm-up for the game. Garry Hill's men did not appear pre-match in protest at not being paid for March. But Shaun Pearson's own goal and two Michael Cheek efforts put Ebbsfleet in control before Stuart Beavon and Pearson replied. Gozie Ugwu sealed Ebbsfleet's win. Ebbsfleet are two points off the play-offs in eighth spot while Wrexham remain fourth despite their fourth defeat in five games and are five points behind leaders Leyton Orient. The home side went ahead on 10 minutes when Wrexham captain Pearson turned the ball into his own net from Myles Weston's cross. Michael Cheek doubled the lead when he nodded home from a corner before scoring his second a minute before the break. Wrexham scored early in the second half when Beavon, one of three substitutes manager Bryan Hughes introduced at the break, turned in Paul Rutherford's drive. Pearson made amends for his earlier own goal when he netted following a goalmouth scramble but, as Wrexham pushed for a late equaliser, Ugwu fired home Ebbsfleet's fourth from 10 yards. Wrexham manager Bryan Hughes said: "The first half was poor, we didn't get ourselves into the game. We rectified it a bit at half time by putting our cards on the table with three substitutes. "We had a right go in the second half and that's the sort of passion and commitment that I want to see from the team. "On another day we might have got something from the game but it wasn't to be." Match ends, Ebbsfleet United 4, Wrexham 2. Second Half ends, Ebbsfleet United 4, Wrexham 2. Substitution, Ebbsfleet United. Ebou Adams replaces Dean Rance. Goal! Ebbsfleet United 4, Wrexham 2. Gozie Ugwu (Ebbsfleet United). Mark Carrington (Wrexham) is shown the yellow card. Goal! Ebbsfleet United 3, Wrexham 2. Shaun Pearson (Wrexham). Substitution, Ebbsfleet United. Bagasan Graham replaces Michael Cheek. Shaun Pearson (Wrexham) is shown the yellow card. Jack Payne (Ebbsfleet United) is shown the yellow card. Substitution, Ebbsfleet United. Andy Drury replaces Corey Whitely. Jason Oswell (Wrexham) is shown the yellow card. Goal! Ebbsfleet United 3, Wrexham 1. Stuart Beavon (Wrexham). Substitution, Wrexham. Stuart Beavon replaces Anthony Spyrou. Substitution, Wrexham. Luke Young replaces Kemy Agustien. Substitution, Wrexham. Jason Oswell replaces Jermaine McGlashan. Second Half begins Ebbsfleet United 3, Wrexham 0. First Half ends, Ebbsfleet United 3, Wrexham 0. Goal! Ebbsfleet United 3, Wrexham 0. 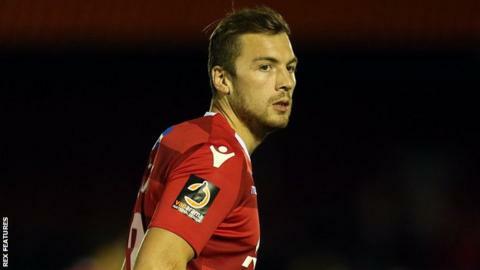 Michael Cheek (Ebbsfleet United). Goal! Ebbsfleet United 2, Wrexham 0. Michael Cheek (Ebbsfleet United). Own Goal by Shaun Pearson, Wrexham. Ebbsfleet United 1, Wrexham 0.